PTDAlertViewController is a wrapper around UIalertController that displays Alerts with simple code. Message dialogue display with no button. After a certain number of seconds have elapsed, a message dialog will be displayed which closes automatically. You can also specify the number of seconds to close. And, by tapping outside of the message dialog, the user can erase the dialog immediately. Message dialogue display that displays one button. You can detect that you tapped the dialog button with a closure. Message dialogue display to display two buttons. // MARK: Message dialogue display with no button. 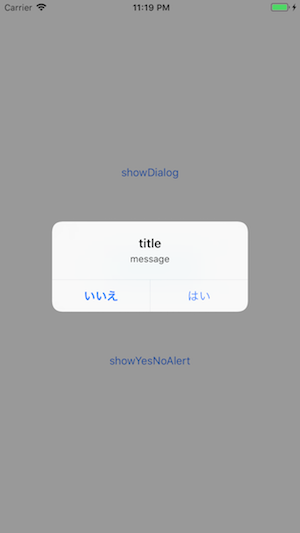 // MARK: Message dialogue display that displays one button. // MARK: Message dialogue display to display two buttons.